Welcome back! Ok, so today we are going to be looking at 2 of the 3 plugin effects from the early Jordan Juniors series made by Jordan Electronics out of Alhambra, CA. featuring the 1967 Jordan Boss Tone and the 1967 Jordan Boss Boost. I really should be showing the Vico Vibe too, but unfortunately I just missed one on the bay! NOOOOOOOOOOOOOOO!!!!!!!!!!!!!!!!!! It's all good, we will do with what we got. Let's just pretend they never made a vibrato and that this is the most comprehensive Jordan Juniors-based informational site in the world.,. By now this is an extremely well known fuzz that defines thickness and saturation; but it wasn't always like that, and in fact this early first version of the Boss Tone has a completely different sound than any other version that came after it. 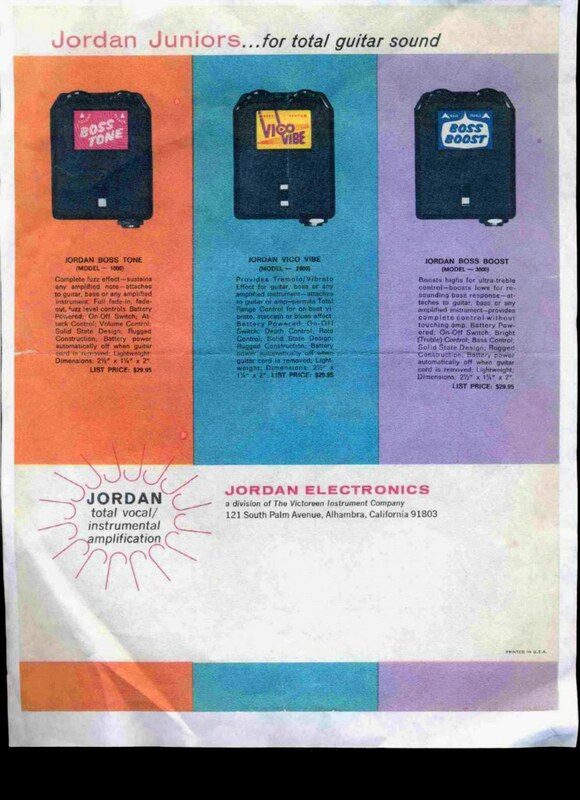 The story goes that in the early '60s Jordan Electronics was building amplifiers in order to capitalize and compete with the VOX/British amp explosion that was sweeping the nation, via the Beatles. They then decided to come out with a fuzz unit as the popularity of pedals such as the Maestro Fuzz Tone, the Tonebender MKI, and the Mosrite Fuzz Rite were finding their way into all facets of popular music. 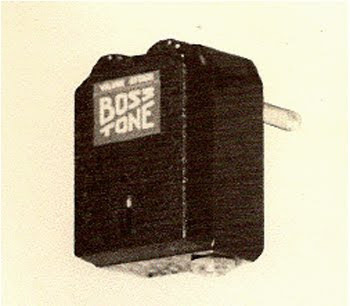 So in late 1966 they developed the Boss Tone, a trebly fuzz that stood out amongst the crowd for being more articulate and much less gated than either the FZ-1 or the MKI. How many test and 1st production units were made are not known, but as pictured below from a 1966 magazine ad, you can see the cool 1st logo that Jordan decided NOT to go with once it went into full production. Jump ahead a year to 1967 and we find Jordan Electronics poised and ready to drop some cool new effects on the world of Rock & Roll. Although the idea of effects pedals that plugged directly into your guitar most likely came from VOX with their Distortion Booster (1965), Jordan took the idea and made it more compact and work better! The first of these, and the king of all plugin effects, was the Boss Tone fuzz unit. So how does it sound, you ask? My real answer is; totally weird! It's very nasally and does a great impression of a small swarm of bees trying to eat your brain by way of your ears. It's not nearly as biting as the Maestro FZ-1a, but it has absolutely no low end or thickness at all. Now I know you're thinking, "but Ed, you're making this thing sound like it's a piece of crap!" I know, I know. I promise you though, it's Not... The real magic happens when you run it through an EQ or a low-end boosting pedal and then BLAM! it comes to life. I actually love to run the Boss Tone into the Boss Boost in a process where the original weak signal has coalesced on the other end into this loud, thick, stinging, Neanderthal of a fuzz tone; that sort of reminds me of a rusty razor blade you might find on the floor of an old bathroom or something? Although I don't consider myself a pedal circuit understanderer, I can say from hearing it that there are similarities between this original Boss Tone and the FZ-1a and possibly a little Shin Ei FY-2 thrown in the mix for fun (although I think that came out afterwards?). Either way, it is a distinctive tone and it's really cool to see where this grand master of the fuzz world got its start. In later posts we'll dissect the other versions of the Boss Tone, but for now it's all about numero UNO! Ok kids, it's picture time!!! stay tuned for part 2... The Jordan Boss Boost! for info on the 2nd version of the Bosstone: Go Here! Oh man...Oh man I miss mine! I had one from the 60's and LOVED it. It broke, didn't know how to fix it. Held on to it but it got lost over the years. The thing really MELTED the tone and I can't really describe it any better. Nothing I've had or heard since comes close. It really was like running your guitar through a arc welder..Can't come any closer...Man I miss it. The Bosstone is really one of my alltime favorite fuzzes. Nothing else really sounds like them. Stay tuned, because I will be posted a review of the 2nd version of the Bosstone in the coming weeks. Cool! Will be waiting on that review! I'll email you in a bit. I may know someone who can help. Made by Victoreen? Hahaha..they're slightly more famous for making Geiger counters.